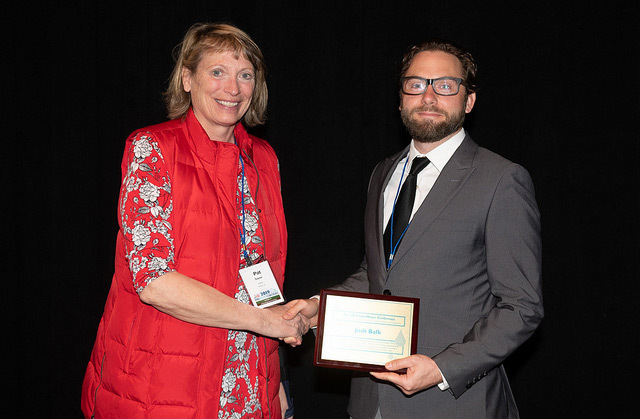 The Iowa Stormwater Education Partnership is pleased to announce that Josh Balk with Blackhawk Soil and Water Conservation District recently received a Stormwater and Urban Watershed Partner of the Year Award at the 2019 Iowa Water Conference in Ames. The award recognizes Josh for his leadership role as project coordinator with Blackhawk SWCD in securing funding to implement green infrastructure locally, educating local stakeholders on ways to implement conservation practices to protect water quality in local streams. Josh was involved with the installation of numerous rain gardens and has trained hundreds of students on green infrastructure practices. Josh through the SWCD, developed a strong partnership with the City of Cedar Falls to help construct two permeable paver alleys funded through an IDALS Water Quality Initiative Urban Conservation grant. The Iowa Stormwater Education Partnership is a non-profit organization that supports municipal stormwater programs through the creation of educational resources and training programs.